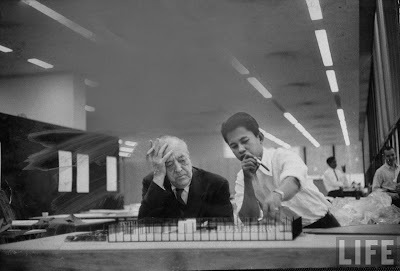 Nice that the popular magazine LIFE appreciated so early what Mies was trying to do. 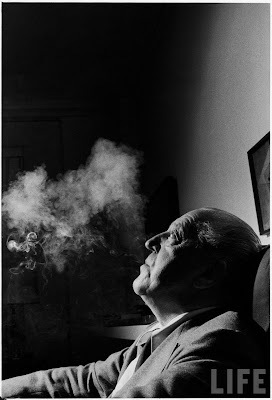 Mies van der Rohe relaxing on couch while smoking cigar and reading at home. 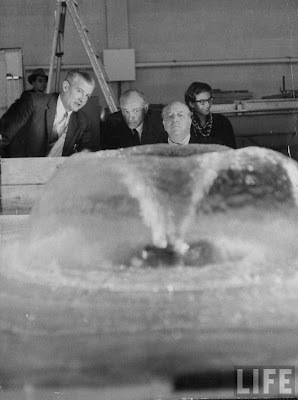 They look to be working on a model of the New National Gallery in Berlin. Or is that a student’s variation of it? 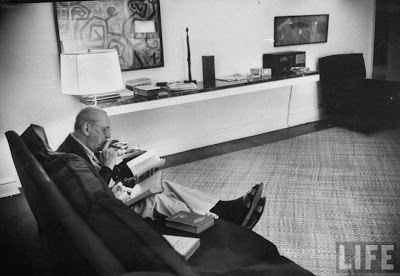 And with Philip Johnson. The woman looks like Phyllis Lambert. Nice to know they were made in Chicago. 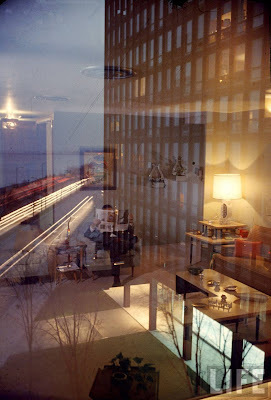 And finally, a photo of the still unfinished Mies’ 860 – 880 Lake Shore Drive Apartments. All other photos: Frank Schersel. Remember I told you we were going to restore the darn things, and the plaza? It’s happening! Can you tell? That had been original travertine on the inside. Something will be lost, but much will be gained. 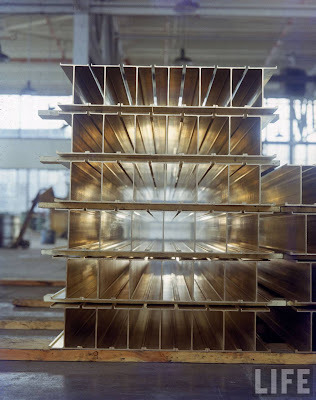 Water had been seeping through and corroding the steel. And this “plasticized glass,” not original but from an earlier intervention, will be replaced with an acid-washed glass which is far more elegant. Architects Krueck and Sexton, who restored Crown Hall recently and magnificently, are doing this work. Rico Cedro is their man on the job. Gunny Harboe, known for quality and important restorations is also working on this. It’ll go on for months. I can’t wait to see it when it’s complete. Huh? I’d like to hear more on that. 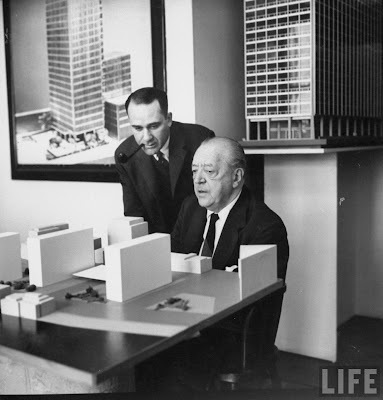 Funny, like the Barcelona Pavilion, which for so long was known only from memory and black and white photos, until it was “reconstructed;” it is (as “cityofparis” says in a comment to this post) very odd to see a color photograph of Mies. It does make him come alive in a more modern way. The color even makes him seem a little less dour than we think he is in most of the black and whites. And from the angle, he is floating. 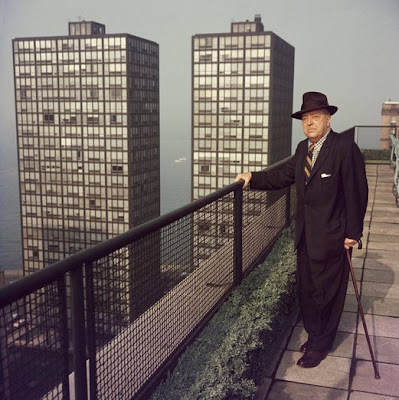 As his buildings do. 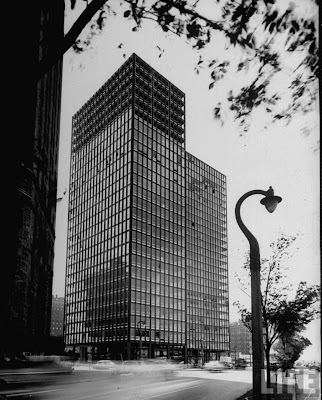 You are currently browsing the archives for the Lake Shore Drive Apartments category.